We know it’s getting colder outside with the holiday season rolling in, but of course you’d still like to go out and take in the sights. It’s a great season for horse and carriage rides through the park, pedicab tours, or even ice skating at the rink. The perfect accompainiment to those sights are cups of hot cocoa! The list below is your guide to the absolute best places to stop and sip some chocolatey deliciousness around Central Park! The gianduja-flavored hot chocolate at Grom tastes like liquid Nutella. Best known for their gelato, this eatery makes a fantastic cocoa for those too chilly to have some frozen dessert. With both dark and milk chocolate versions, Grom is sure to please with milk, cream, Venezuelan and Colombian chocolates. 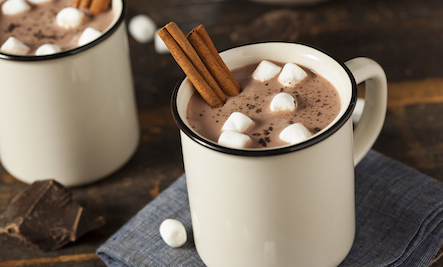 One of New York’s magic chocolatiers provides customers with some “wicked” hot chocolate with just a touch of ancho and chipotle peppers in addition to the classic style. 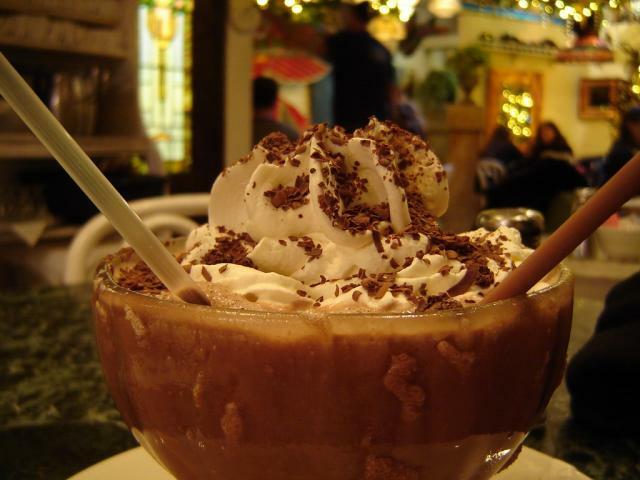 Serendipity 3’s oxymoronic Frrrozen Hot Chocolate has so many New Yorkers in awe. Is it even possible for a drink to be both frozen and hot? Just don’t think about the logic behind it too much and don’t down it too fast either – just enjoy! Sure enough, the famed Russian Tea Room, home to such ornate decorations as a 20-foot-tall golden tree adorned with Venetian glass eggs—and whose menu features, for example, Golden Osetra caviar—offers its own “signature hot chocolate,” complete with whipped cream and marshmallows. The toasty, tasty treat is a relatively affordable way to get a foot in the door at one of the City’s fanciest eateries. Dessert tycoon Max Brenner (a fictional character who’s a composite of the venue’s two founders) serves hot chocolate in a specially designed “hug mug,” which encourages patrons to hold the drink with both hands for maximum comforting effect. The cocoa is available in milk, dark and white chocolate versions. Famous for its feature role in You’ve Got Mail, this go-to spot is on the map for its cakes, pies, tarts and of course hot chocolate! With a range of flavorful mix-ins or shots of alcohol to add in, Cafe Lalo’s hot cocoa is sure to warm your insides. A great spot to stop with the kids to decorate your own chocolate treats, Voilà Chocolat also offers a variety of flavors for adults and children alike. From their Classic Dark House Blend to a Daredevil Spiced or even an exotic Matcha Green Tea White Hot Chocolate to thrill the senses. Now they even offer a Pumpkin Spice White Hot Chocolate for those seasonal types.